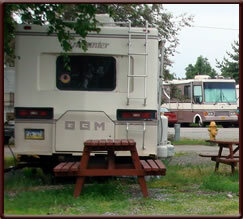 A spacious, quiet and safe RV Park with 215 Sites. Centrally located near Downtown, Shopping Malls, and Restaurants. The Golden Nugget is "Big Rig" and caravan friendly and has 34 large pull-thru sites and 87 back-in sites to accommodate larger rigs and tow vehicles. Adjacent to our park is: a Municipal Park with Kaboom playground equipment for children and a large wooded exercise area for walking pets. Copyright © 2010 Malaspina Glacier Investments, LLC. All Rights Reserved.